The effect of the addition of lactoferrin on Staphylococcus aureus to Minas frescal cheese was evaluated. Three cheeses were made: control (S. aureus), Lf-2% (2% lactoferrin + S. aureus) and Lf-4% (4% lactoferrin + S. aureus). Cheeses were packaged and S. aureus populations were determined on days 1, 8, 15, 22 and 29 of storage at 6°C. The experiment was repeated three times. S. aureus population increased 1.3 logarithmic cycles in the control cheese during storage, while it decreased to numbers below the detection limit in cheeses containing lactoferrin, over the same period. Moreover, antimicrobial effect showed to be dose-dependent. Key words: Pathogenic microorganisms, antimicrobial activity, bioactive compounds. O efeito da adição de lactoferrina sobre a viabilidade de Staphylococcus aureus inoculado em queijo Minas frescal foi avaliado. Três queijos foram produzidos: controle (S. aureus), Lf-2% (2% lactoferrina + S. aureus) e Lf-4% (4% lactoferrina + S. aureus). Os queijos foram armazenados e as populações de S. aureus foram determinadas durante o armazenamento refrigerado a 6°C nos dias 1, 8, 15, 22 e 29. Os experimentos foram realizados em triplicata. As populações de S. aureus aumentaram 1,3 ciclos logarítmicos nos queijos controle durante o armazenamento, enquanto que essas populações foram reduzidas abaixo do limite de detecção nos queijos contendo lactoferrina no mesmo período. Além disso, observou-se que o efeito antimicrobiano foi dose-dependente. Palavras chave: Microrganismos patogênicos, atividade antimicrobiana, compostos bioativos. Universidade Norte do Paraná, UNOPAR, PR, Brasil. Universidade Federal de Mato Grosso do Sul (UFMS), Faculdade de Medicina Veterinária e Zootecnia, Campo Grande, MS, Brasil. Minas frescal is a popular Brazilian unripened cheese made from cow’s milk. Due to its high moisture content, low acidity and soft texture, it is susceptible to the development of bacteria that, in addition to limiting the shelf life of the product, may impose a health hazard to consumers, since pathogenic bacteria frequently associated with outbreaks of foodborne diseases, such as those caused by Staphylococcus aureus, which can easily contaminate and develop in this cheese (1). Contamination of cheeses by S. aureus is mainly attributed to the use of raw milk in its manufacturing, or to defects and flaws during processing, principally during pasteurization, post-processing handling or along the distribution chain of the product (2). This microorganism, a ubiquitous pathogen, can cause human diseases like mastitis, toxic shock syndrome and staphylococcal food poisoning (3). In addition, resistant and multi-drug-resistant staphylococcal strains have been isolated from humans and animals (4). S. aureus in foods has become a major health threat to people all over the world due to the its high transmissibility and virulence, increasing predominance over antibiotic-resistant bacteria, limited therapeutic options and wide distribution in both hospital and community settings (5). For that reason, alternatives must be developed by the industries to ensure the microbiological safety of the foods, and consequently, the health of the consumer. Lactoferrin and its peptides are a promising class of antimicrobial compounds in the fight against pathogenic microorganisms, including S. aureus. Lactoferrin is a multifunctional iron-binding protein belonging to the transferrin family and is found in mammals, produced by the mammary glands, glandular tissue on mucosal surfaces and is also present in secretory granules of polymorphonuclear leukocytes (6). Lactoferrin may have beneficial preventive and therapeutic effects on infections, inflammations, and cancer, in addition to enhancing the iron status and the growth performance of vulnerable groups (7). The bactericidal function of bovine lactoferrin is partially the result of the direct interaction between the positive charged regions with anionic molecules present on the surface of some microorganisms, which causes an increase in the membrane’s permeability, inflicting damage to the bacteria (8). According to Shimazaki (9), there are three models to explain the multi-functionality of lactoferrin. The first suggests that specific sites or fragments of the lactoferrin molecule constitute binding or active sites that enable lactoferrin to function. The second model involves lactoferrin binding and/or transferring various biological substances and behaving in a cooperative or competitive manner. And the last model suggests that lactoferrin induces or suppresses the production of chemical mediators to control immune cells on the intestinal epithelium, thereby affecting tissues or organs apart from the digestive tract. 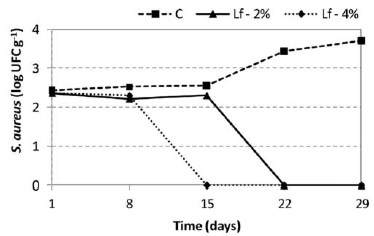 Thus, the objective of this study was to evaluate the action of two different concentrations of lactoferrin on Staphylococcus aureus added to Minas frescal cheese, with the aim of exploring the protective potential of lactoferrin - a natural component of milk - to inhibit the growth of pathogenic microorganisms in foods. The Staphylococcus aureus strain, obtained from the Food Microbiology Lab of the Faculty of Pharmaceutical Sciences, University of Sao Paulo, Brazil, was grown in brain heart infusion broth (BHI) and incubated at 37o C. After 24 h, the broth was centrifuged at 1050 x g for 15 minutes at 4oC, washed with 0,85% (w/v) saline solution, aliquoted in 1 mL portions and kept frozen at -80oC with 25% (v/v) glycerol. Each 1 mL portion contained approximately 5 x 102 cfu.mL-1. The fat content of whole pasteurized milk was standardized to 3% by adding pasteurized skimmed milk, subsequently heated to 35°C and added with 50% calcium chloride (0.25 mL L-1), lactic acid 85% (0.25 mL L-1) and rennet (1:10 dilution in distilled water). After 30 minutes, curdling was verified and the clot was cut and left to stand for five minutes. Next, part of the whey was drained off, followed by the addition of salt and (10 g L-1) and an additional holding time of two minutes. After another additional round of draining off part of the whey, the cut curd was inoculated with a population of 5 × 102 CFU mL-1 Staphylococcus aureus and divided into three equal parts, with lactoferrin (0.2 g/100 g curd and 0.4 g/100 g curd) being added to two of these parts. After molding, the cheese curds turned and stacked three times at 15 minute-intervals. After a period of 12 hours cold storage at 6°C, the cheeses were released from the molds and cut up into 25 g-portions, which were immediately vacuumpacked into polyethylene packages and stored at 6°C. The entire experiment was repeated three times. On days 1, 8, 15, 22 and 29 of storage, the Staphylococcus aureus populations contained in the Minas frescal cheeses were enumerated according to official methods (10). On each day of analysis, sample portions each weighing 25 g were homogenized with 225 mL of a sterile saline solution (0.85%) in appropriate plastic bags. From this initial dilution, a series of decimal dilutions was prepared using the same diluent. Aliquots of 0.1 mL of the dilutions were seeded onto Petri plates containing Baird-Parker Agar supplemented with potassium tellurite and an egg yolk solution and subsequently incubated at 35°C. After 48 hours, typical colonies (black-colored, with or without a halo) were counted and the population calculated and expressed as Colony Forming Units (CFU) per gram of cheese. A total of five suspected colonies from each plate was subjected to the catalase and coagulase tests for confirmation. After 1, 8, 15, 22 and 29 days of storage, the pH of the cheeses was determined according to the procedures of the American Association of Official Agricultural Chemists (11). The effect of the addition of lactoferrin the pH and S. aureus population of Minas frescal cheese throughout the shelf life investigated was evaluated by analysis of variance (ANOVA) using the Statistica software program (12). The initial mean pH values of the cheeses were 6.44, for the control cheese, 6.42 for the cheese added with 2% lactoferrin, and 6.40 for the cheese containing 4% lactoferrin (Figure 1). FIGURE 1. Mean pH values observed in Minas frescal control cheese and cheeses treated with lactoferrin, during the 29 days of storage under refrigeration. C = control cheese; Lf-2% = cheese with 2% added lactoferrin; Lf-4% = cheese with 4% added lactoferrin. The mean counts of the S. aureus populations of the control cheese and the lactoferrin treatments in the course of the 29-day storage period investigated are presented in Figure 2. The initial population - approximately 2.5 log CFU g-1 (p>0.05) - was the same for all the formulations, which is the maximum population of coagulase-positive Staphylococcus per gram of very high moisture cheese allowed by the Brazilian food regulations currently in force (13). FIGURE 2. Mean values of the S. aureus populations of the Minas frescal control cheese and the cheeses treated with lactoferrin, kept under cold storage for 29 days. C = control cheese; Lf-2% = cheese with 2% added lactoferrin; Lf-4% = cheese with 4% added lactoferrin. It was found that in the control cheese, the S. aureus populations remained constant up to 15 days of storage, verifying from that point in time onwards a statistically significant increase (p<0.05) in the counts, greater than one logarithmic cycle (Figure 2). When added with lactoferrin, it was observed that this protein did not allow the multiplication of S. aureus during the storage period of the cheeses (Figure 2). At the concentration of 2%, it was verified that the population of S. aureus remained unchanged for 15 days (p>0.05), declining significantly (p<0.05) from that point in time onwards until it was no further detected by the method utilized up to the end of the storage period. When 4% lactoferrin was added, the S. aureus populations started to decline already after the 8th day. According to Furtado (14), the initial pH of Minas frescal cheese produced with lactic acid varies between 6.3 and 6.5. These values may fall to pH 5.2 – 5.4 during shelf life, as a function of the degree of contamination and the overall conditions of the points of sale. 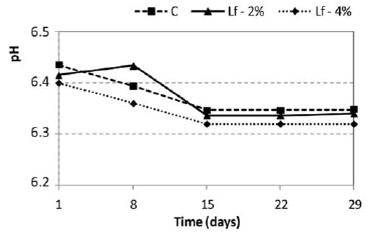 It can be observed from Figure 1 that the pH of the control cheese and those treated with lactoferrin declined to the same extent and with a similar time course throughout the 29 days of refrigerated storage investigated (p<0.05). The reduction was 0.09 for the control sample and 0.08 for the lactoferrin-added samples, with the pH values never falling to levels lower than 6.34. This drop in pH is probably due to the production of lactic acid during fermentation of lactose by bacteria (15). However, these values are not considered a limiting factor for the proliferation of S. aureus. According to Beresford et al (16), the optimal pH for the multiplication of most of the bacteria is close to neutral and their multiplication is impaired at values lower than 5.0. Other authors found pH values similar to those observed in the present study when evaluating Minas frescal cheeses produced by direct acidification (17, 18). Cheeses acidified with lactic acid have higher pH values than those acidified with lactic starter culture. In Brazil, there is a trend towards partially or totally replacing lactic starter cultures by lactic acid in cheeses, although it is known that only the addition of lactic cultures ensures the permanent production of lactic acid and, consequently, lower pH values of the products during storage (19), which would help to control the development of spoilage and pathogenic bacteria that may be present in this food. Regarding S. aureus populations, if we consider that the freshness or "best before" date estimated by the manufacturers of Minas frescal covers a period varying from 21 to 30 days, cheeses containing populations close to 2.5 log UFC g-1 when distributed to the retail establishments and which were released for sale by legislation may become a serious public health hazard. In Brazil, the presence of S. aureus is relatively common in fresh, unripened cheeses, with populations well above the legally permitted levels. Several authors have reported on in vitro antimicrobial activity of lactoferrin against pathogens (20, 21, 22, 23), but only a few evaluated this activity against S. aureus (5, 24). At present, several natural antimicrobial compounds that prevent the development of spoilage and pathogenic microorganisms have been studied by the food industry, such as is the case of lactoferrin. One of the reasons for these investigations lies in the fact that the digestion of this protein by pepsin generates two fragments - lactoferricin and lactoferrampin - which are even more potent against bacteria, compared to the intact protein (5). Furthermore, some S. aureus strains are known to be resistant to antimicrobials and the possibility to use lactoferrin to control them, by sequestering iron and limiting the use of this nutrient by pathogen (25) in food is interesting. Murdock e Matthews (26) evaluated the antimicrobial activity of bovine lactoferrin hydrolysate with pepsin against Escherichia coli and Listeria monocytogenes in peptone yeast extract glucose broth and ultra-high temperature milk. The authors concluded that, under conditions of low pH and refrigeration temperatures, lactoferrin hydrolysate can limit or reduce the populations of pathogenic bacteria in a dairy product. Lactoferrin prevented the increase of the S. aureus population in the cheeses, at the two concentrations tested, acting initially as a bacteriostatic when the cheeses were inoculated with a population of 5 × 102 UFC g-1 S. aureus. Furthermore, bactericidal action was observed after the 15th day of storage when lactoferrin was added at a concentration of 2%, and after the 8th day at the concentration of 4%, which is interesting in view of the fact that this type of cheese has a short shelf life. We would like to thank the Universidade Norte do Paraná (UNOPAR) and the Fundação Nacional de Desenvolvimento do Ensino Superior Particular (FUNADESP), for supplying the financial support that made this research project possible. Nascimento MS, Moreno I, Kuaye AY. Applicability of bacteriocin-producing Lactobacillus plantarum, Enterococcus faecium and Lactococcus lactis ssp. lactis as adjunct starter in Minas Frescal cheesemaking. Int J Dairy Technol. 2008; 61: 352-57. Borges MF, Arcuri EF, Pereira JL, Feitosa T, Kuaye AY. Staphylococcus enterotoxigênicos em leite e produtos lácteos, suas enterotoxinas e genes associados: revisão. Boletim CEPPA. 2008; 26: 71-86. Le Loir Y, Baron F, Gautier M. Staphylococcus aureus and food poisoning. Genet Mol Res. 2003; 2: 63-76. Miller LG, Kaplan SL. Staphylococcus aureus: a community pathogen. Infect Dis Clin N Am. 2009; 23: 35-52. Flores-Villaseñor H, Canizalez-Román A, Reyes-Lopez, KN, Garza M, Zazueta-Beltrán J, León-Sicairos N, Bolscher JGM. Bactericidal effect of bovine lactoferrin, LFcin, LFampin and LFchimera on antibioticresistant Staphylococcus aureus and Escherichia coli. Biometals. 2010; 23: 569-78. Lonnerdal B, Iyer S. Lactoferrin: molecular structure and biological function. Annu Rev Nutr. 1995; 15: 93-110. Lonnerdal B. Nutritional roles of lactoferrin. Curr Opin Clin Nutr Metab Care. 2009; 12: 293-97. Haversen L, Kondor N, Baltzer L, Hanson LA, Dolphin GT, Duner K, Mattsby-Baltzer I. Structure-microbicidal activity relationship of synthetic fragments derived from the antibacterial alpha-helix of human lactoferrin. Antimicrob Agents Ch. 2010; 54: 418-25. Shimazaki KI, Kushida T. A preliminary approach to creating an overview of lactoferrin multi-functionality utilizing a text mining method. Biometals. 2010; 23: 453-63. Lancette G, Bennett RW. Staphylococcus aureus and Staphylococcal Enterotoxins. In: Compendium of methods for the microbiological examination of foods. American Public Health Association (APHA); 2001. p. 387-400. Association of Official Analytical Chemists. Official Methods of Analysis. 17th ed. Washington, DC: AOAC; 2003. Statsoft Inc. STATISTICA for Windows [Computer program manual], Tulsa, OK: StatSoft, Inc., 2000. Brasil. Agência Nacional de Vigilância Sanitária – ANVISA. Resolução RDC n° 12, de 02 de janeiro de 2001, 2001. Furtado MM. Principais problemas dos queijos: causas e prevenção. São Paulo: Fonte Comunicações e Editora; 2005. Eskin MNA. Biochemistry of foods. London: Academic Press; 1990. Beresford TP, Fitzsimons NA, Brennan L, Cogan TM. Recent advances in cheese microbiology. Int Dairy J. 2001; 11: 259-74. Souza CHB, Saad SMI. Viability of Lactobacillus acidophilus La-5 added solely or in co-culture with a yoghurt starter culture and implications on physicochemical and related properties of Minas fresh cheese during storage. Food Sci Technol. 2009; 42: 633-40. Alves CCC. Comportamento da Escherichia coli em queijo minas Frescal elaborado com utilização de Lactobacillus acidophilus e de acidificação direta com ácido lático. [Dissertação]. Rio de Janeiro: Universidade Federal Fluminense; 2010. Rocha JS, Buriti FCA, Saad SMI. Condições de processamento e comercialização de queijo-de-minas frescal. Arq Bras Med Vet Zootec. 2006; 58: 263-72. Oliveira IR, Araujo AN, Bao SN, Giugliano LG. Binding of lactoferrin and free secretory component to enterotoxigenic Escherichia coli. FEMS Microbiol Lett. 2001; 203: 29-33. Di Biase AM, Tinari A, Pietrantoni A, Antonini G, Valenti P, Conte MP, Superti F. Effect of bovine lactoferricin on enteropathogenic Yersinia adhesion and invasion in HEp-2 cells. J Med Microbiol. 2004; 53: 407-12. Superti F, Pietrantoni A, Di Biase AM, Longhi C, Valenti P, Tinari A. Inv-mediated apoptosis of epithelial cells infected with enteropathogenic Yersinia: a protective effect of lactoferrin. Res Microbiol. 2005; 156: 728-37. Murdock CA, Cleveland J, Matthews KR, Chikindas ML. The synergistic effect of nisin and lactoferrin on the inhibition of Listeria monocytogenes and Escherichia coli O157:H7. Lett Appl Microbiol. 2007; 44: 255-61. D’Almeida WK. Efeito da lactoferrina na conservação do queijo Minas frescal. [Dissertação]. Londrina: Universidade Norte do Paraná, 2009. Bhimani RS, Vendrov Y, Furmanski P. Influence of lactoferrin feeding and injection against systemic staphylococcal infections in mice. J. Appl. Microbiol. 1999; 86: 135–44. Murdock CA, Matthews KR. Antibacterial activity of pepsin-digested lactoferrin on foodborne pathogens in buffered broth systems and ultra-high temperature milk with EDTA. J Appl Microbiol. 2002; 93: 850-56.